"The use of sea and air is common to all; neither can a title to the ocean belong to any people or private persons, forasmuch as neither nature nor public use and custom permit any possession therof." From Nancy Weaver, a great combination of clean energy, experiencing the outdoors, and helping out the hostess, all in one. Do you have a photo that represents any of VCS' goals, or just gives you that "green" feeling? Send them to almanac@vineyardconservation and we might run it! Please help the Public Rain Garden at Waban Park (O.B.) get ready for the off-season. Volunteers are needed to cut down this year's foliage and for a final weeding. If interested, please contact Steve Auerbach for more information, auerbachsteve@gmail.com or 693-9315. 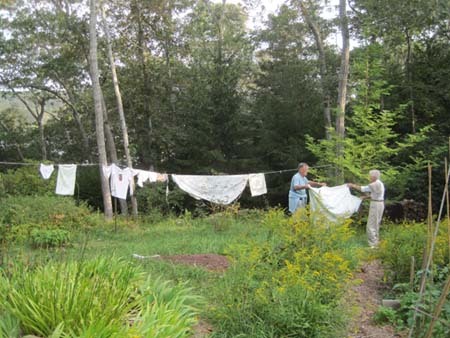 Friday, Sept 30, 2:00 to 6:00 pm, Native Earth Teaching Farm, Chilmark. Come join in Native Earth's current permaculture project, creating an edible forest. Friday's planting session involves setting in place spawn of edible mushrooms. For more information, see the website, or call 508-645-3304. Saturday, Oct 1, 9:00 am to 2:00 pm, Oak Bluffs. These muffins were a hit with kids at the Edgartown School, who made them during class with carrots from the school garden (a project inspired by IGI’s farm-to-school program). They’re similar to carrot cake, but a bit healthier, using whole wheat flour and getting some of their sweetness from orange juice in place of sugar. 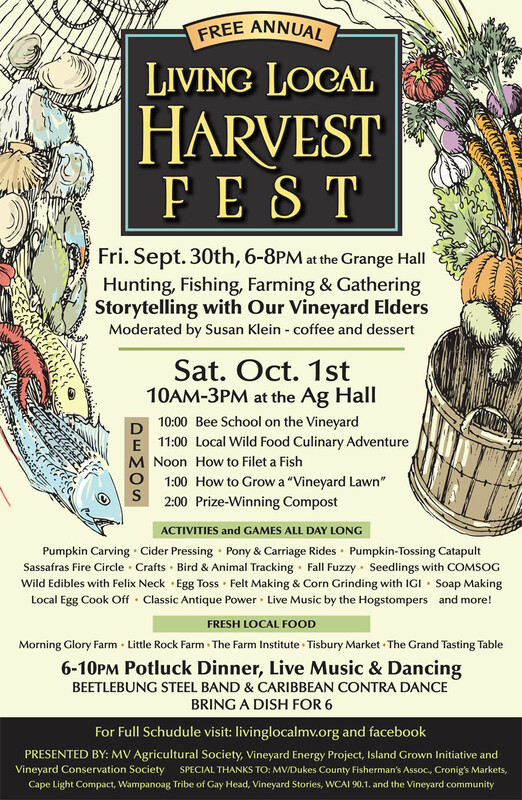 The free annual Living Local Harvest Festival, presented by Martha’s Vineyard Agricultural Society, Vineyard Energy Project, Island Grown Initiative and Vineyard Conservation Society will be held Saturday, October 1st from 10AM-3PM at The Agricultural Hall in West Tisbury, MA. Rain date is Sunday, October 2nd. The festival features activities for kids of all ages (Like a pumpkin-throwing catapult! But see the press release, 4th paragraph) and interactive educational demos. This year, two demos may be of particular interest to VCS members: “How to Grow a Vineyard Lawn” provides information on how you can participate in an ongoing VCS initiative, and “Prize-Winning Compost” should be interesting to any folks thinking of starting (or improving) their home compost. How to Grow a Vineyard Lawn . . . growing a Vineyard-friendly alterative to manicured lawns. There are alternatives to “perfect suburban lawns.” They are cheaper, easier to maintain and far more environmentally friendly. Kris will talk about what we can do to achieve a different vision for our own homes and the land surrounding them…one that protects our drinking water, our ponds and our fisheries. Prize-Winning Compost . . . how to make the best compost on the Island. The First, Second and Third Place prizewinners of the first composting competition at the Ag Fair and its Judge will share some of their secrets. The sharing includes handouts…complete with squirming worms…that are guaranteed to appeal to young and old alike, whether potential gardeners or old hands. In some ways, the similarity between the recent history of our island and that of Orkney, a string of 70 islands just off the north coast of Scotland, is uncanny. The local economy has historically relied on fishing and farming, but has recently seen tourism ascend to play a key role (for example, see Skara Brae, the best-preserved New Stone Age settlement in the world). For now, the similarities end when the subject turns to energy supply, but the Orkney Islands may offer a preview of a renewable energy future. A recent article in the Guardian describes Orkney’s leading edge energy program. In addition to offshore wind, which already provides a large amount of their power, electricity is being generated by harnessing the power of tidal and wave action. Implementation of this rapidly developing technology has been on a scale large enough to create a new high-tech job market, and will make Orkney a major contributor to Scotland’s broader energy supply. Here on our island, one way or another, it seems likely that offshore wind will be the first major renewable energy project. Without diving too deeply into those waters, and acknowledging that the Guardian piece completely ignores the negative impacts of offshore energy, the comparison between Orkney and the Vineyard raises interesting questions. Compared to our proposed wind farms, the payoff in Orkney appears greater, both in the amount of jobs and clean energy generated; presumably, the environmental costs of such a large program are greater as well. But this all-or-nothing approach has some appeal: to have any impact on reducing greenhouse gas emissions in a world of rapidly increasing demand, clean energy projects must be absolutely huge. Further, the idea of hundreds of high-tech jobs for our returning college graduates, and complete self-sufficiency in electricity, is almost fantastical. So the question is, will Cape Wind, or whatever wind farm comes first, be the necessary first step to a comprehensive renewable energy program (including wave and/or tidal), or will it still be the only major project in our waters 50 years from now? And which would be preferable? The State of the Birds, a report released this month by Mass Audubon, indicates that many of the state’s bird species are in decline. The report summarizes decades of data (mostly from three major studies) to determine changes in species abundance. They also discuss habitat loss to development and climate change as important contributors to the struggles of native species, as well as toxic chemicals and predation from feral cats. As reported in the Boston Globe, many marshland and grassland birds have decreased in number, as well as some common species such as blue jays and swallows. Not all birds have been declining, of course. One large study found increases in red-bellied woodpeckers, Carolina wrens, Great blue herons, Cooper’s hawks, and the common raven, as well as Canada geese (for better or worse) and wild turkeys (likewise, though this may not include our semi-feral, and occasionally criminal, fowl).